Still Bay is an excellent location for nature enthusiasts. Highly recommendable: Wide sandy beaches and safe swimming in the warm Indian Ocean, Whale Watching (mid June to November), Bird Watching, Hiking, Surfing, Wind Surfing, Kiting, Fishing (River, Beach and Sea) or Golf (2x 9-hole Golf Courses) etc. 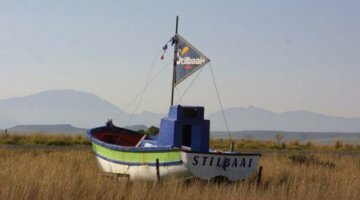 The small village of Jongensfontein is an ideal resort for simply relaxing while 10 km to the east, on a river mouth, Stilbaai offers activities like boating on the estuary and deep sea fishing. Close by is the settlement of Melkhoutfontein, where there are the first botanical gardens to be run by a previously disadvantaged community. or e-mail us on info@theanchorage.co.za. 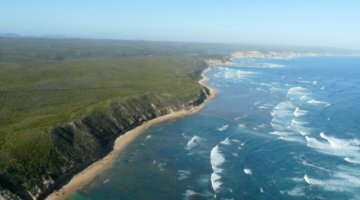 The Garden Route from Stilbaai through Mossel Bay and on to George, Wilderness, Knysna and Tsitsikamma is a magnificent stretch of coastline hosting southern rights in their season, humpbacks between May and December and Bryde's whales all year round. Even killer whales are occasionally spotted. The steps if prehistoric nab can be marvelled at the ancient fish traps which are visible at low tide. Tame eels are fed at 11h00 daily at the historic homestead, Palinggat. Click here to Download PDF Document. Copyright © 2000 - 2010 by [TheAnchorage.co.za]. All rights reserved. Revised: 25 Jan 2010 13:56:17 +0200.